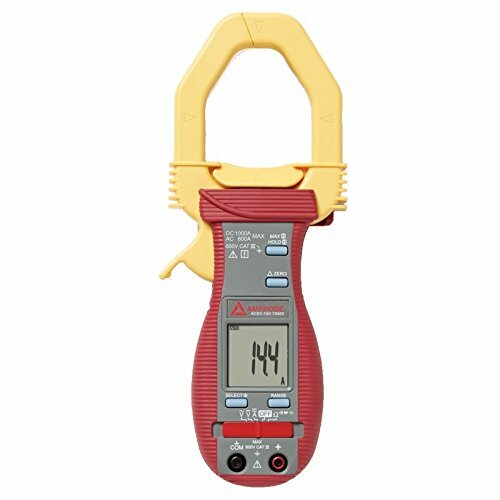 The Amprobe digital clamp meter is auto- or manual-ranging multimeter for measuring current, voltage, capacitance, and resistance in electrical testing applications. It has a Hall effect clamp that measures alternating current (AC) to 800 amp and direct current (DC) to 1,000 amp. The meter comes with detachable test leads that measure DC voltage and AC voltage to 600 volts (V), capacitance to 3,000 microfarads, and resistance to 40 megaohms. 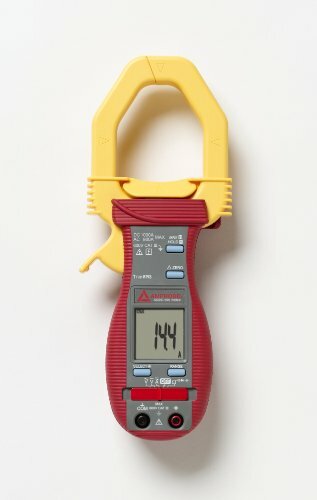 The clamp has two jaws that can close around an electrical conductor up to 2" (50 mm) in diameter to measure current without touching or interrupting the circuit. The inrush reading displays measurement of entire motor inrush period at startup. A relative zero mode stores a reading in memory to use as a zero point for subsequent readings, allowing for quick comparison of multiple readings. The maximum reading mode displays the highest reading in a session to track a sudden increase in measurements. An audible continuity sensor confirms that the circuit conducts electricity, and a diode test detects whether a circuit’s diodes are working properly.